These Boss Audio 12 Inch Dual Voice Coil Subwoofers are awesome for medium to high power applications. The blue light pulsates from inside the cone, giving your music an even cooler vibe. 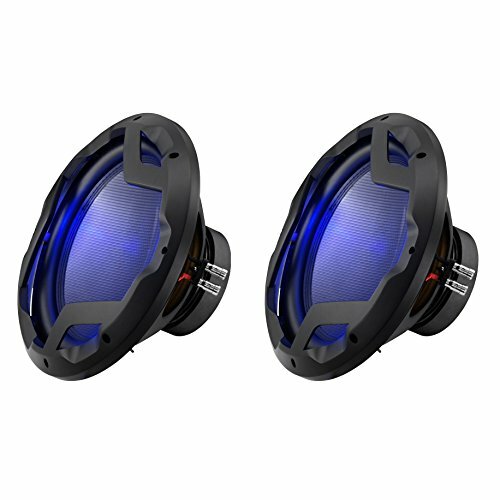 The dual voice coil provides more wiring configuration possibilities. When you add subwoofers, the wiring configurations can be easily matched to optimize the amp's power output and the power handling. Meanwhile, the polypropylene and paper cone is sturdy with a rubber surround. It's best suited for 0.65 cubic foot sealed or 1.5 cubic foot ported enclosures. Use a sealed enclosure for a great, pounding bass or a ported enclosure for a solid, tight bass. Get the sub with awesome blue LED effects that makes you feel even cooler listening to your music, the Boss Audio 12 Inch Dual Voice Coil Subwoofer with LED Illumination. Provides more wiring configuration possibilities. If you add subs, the wiring configurations can be easily matched to optimize the amp's power output and the power handling.